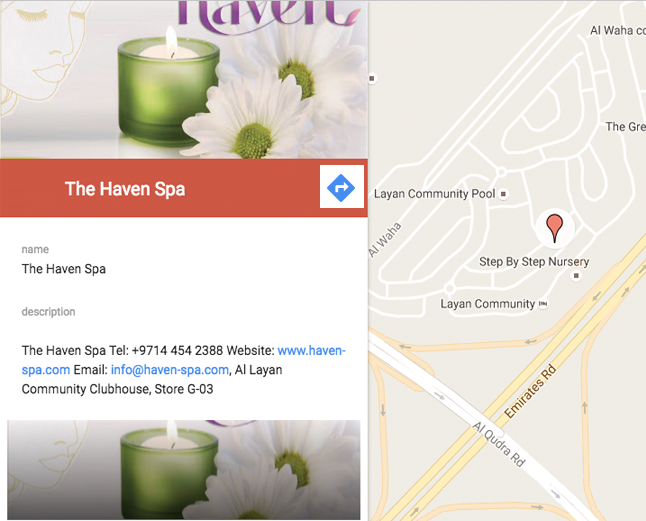 The Haven Spa is located just 5 minutes away from the Global Village& Arabian Ranches. On Emirates Road (facing South in Direction of Abu Dhabi), take Exit 38, and follow to signage to arrive at the Al Layan Community. - When you reach Mohammed Bin Zayed Rd, facing north (the direction of Sharjah) take the Global VillageExit . - On Emirates Road (facing South in Direction of Abu Dhabi), take exit 38 and follow the sign to Al Waha Layan Community.